Use the code PC-GAMER20 to save 20% on tickets. Developers from the Final Fantasy XV team will join us to discuss the highly-anticipated Final Fantasy XV Windows Edition at the PC Gamer Weekender, which takes place on 17 and 18 February 2018 at the Olympia in London. Technical Director Takeshi Aramaki and Game Design Manager Kenichi Shida will take to the stage to talk about the creation of the PC edition of the game, including new features and the numerous improvements made to the game's visuals. Attendees will have the chance to see more of the game in action on PC ahead of its launch on 6 March. The developers will also be taking questions from PC Gamer's community, offering new insight into the development of the Windows Edition, which includes HDR and 8K support and all of the game's previously released DLC. Find out why now's the perfect time to discover this spiffy-looking RPG road trip on your PC. 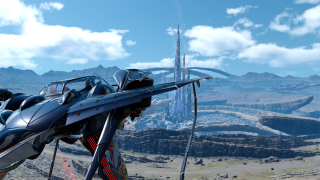 The Final Fantasy XV Development team will join us for both days of the PC Gamer Weekender—12.30 on the Saturday and 11.30 on the Sunday at the PC Gamer stage. Find out more about the event on the Weekender site, and save 20% on tickets with the code PC-GAMER20.